NASA is nothing more than a tool for the military industrial complex to carry out their nefarious agendas and to cover up their tracks. No matter how blatant and glaring the ongoing geoengineering atmospheric aerosol spraying is over our heads each and every day, so long as there is an “official agency” like NASA to tell the public it isn’t so, the geoengineering crimes of planetary omnicide continue to be hidden in plain site. Perhaps the greatest lie the power structure has perpetrated on populations around the world is the “condensation trail” grand deception. ALL commercial airlines and ALL military tankers are outfitted with a “high bypass turbofan” jet engine. This engine is a jet powered fan that is designed for maximum fuel efficiency. 85% of the air that passes through this jet engine is NON COMBUSTED. By design, the “high bypass turbofan” jet engine is nearly incapable of producing any “condensation trail” except under the most rare and extreme of circumstances. With this in mind, why does NASA (and other official agencies) tell us that there is nothing strange or unusual about satellite images like the one below taken on October 16th, 2017. The geoengineering aerosol spraying operations along the West Coast of the North American continent are relentless. NASA made the following statement in reference to the video satellite animation just below the quote. Contrails are showing up nicely across California today. These are NOT associated with the wildfires. 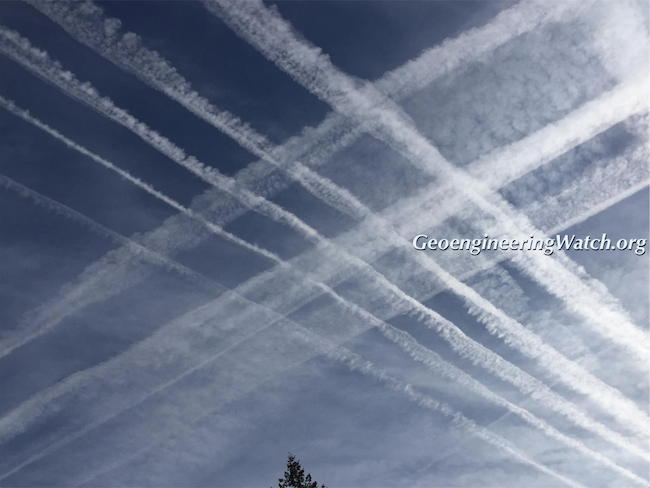 Geoengineering / solar radiation programs are completely disrupting the hydrological cycle, destroying the ozone layer, and contaminating every breath we take. Why does NASA feel it is necessary to reassure the public that the atmospheric atrocities have nothing to do with the record shattering firestorms in the once golden state? Is it because NASA does not want the public to know that climate engineering is a primary factor causing protracted drought all over the planet? Aren’t the sky covering jet aircraft dispersions exactly what we are told we would expect to see if geoengineering / solar radiation management programs were deployed? Yes, exactly. But, again, we are told not to worry, NASA says it isn’t so. 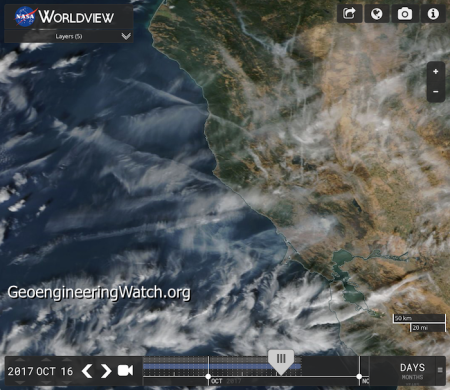 Has the now 10 year long drought in California (with the only break being the winter season of 2016-2017) in fact been caused by the ongoing illegal climate engineering operations? Examine the data in the “Engineered Drought Catastrophe, Target California” presentation below, and decide for yourself. Is geoengineering directly connected to the raging firestorms in California, Portugal, Spain, and countless other parts of the world? The data to confirm the connection is undeniable. The 10 minute video below provides essential facts. Global powers are waging weather warfare against the populations of the planet. 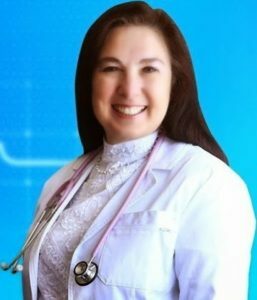 Because the elements used for climate engineering operations are highly toxic, climate engineering must also be considered biological warfare. How long will populations of the world stand by and allow the planetary programs of geoengineering omnicde to continue? Help us to sound the alarm, share credible data which can be found on the home page of GeoenigneeringWatch.org. Make your voice heard while it can still make a difference.